Assuming for the sake of argument that our elected representatives can have a civil conversation and that they choose to examine how to make the Postal Service financially stable, with a sustainable business model, their exchange will quickly reveal how drastically different each sees the USPS. For some typically on the “blue” side, the Postal Service is a service first and foremost. Accordingly, they believe the agency should maintain a presence in communities regardless of whether the facility generates revenue sufficient to cover its cost of operation, and that the USPS should provide traditional levels of service – such as overnight delivery to a significant area, six-day delivery, and delivery to the door or at least the curbline. 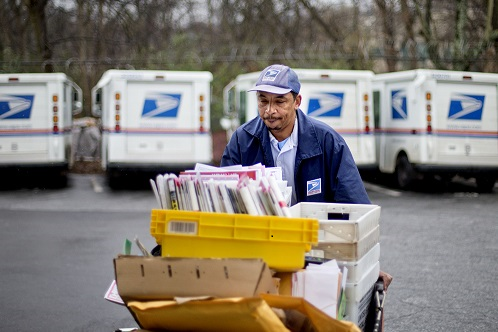 They further believe that the USPS has a social role, such as by providing “good-paying” jobs, promoting a diverse workforce, and offering services to the public (such as postal banking) that aren’t adequately offered otherwise. Service-oriented politicians campaign against the closure or consolidation of post offices (or stations and branches) because of their alleged impact on access to postal services and community identity. They oppose processing plant consolidations under the premise that service will be adversely affected, employees will be impacted, and that “good-paying” jobs will be lost. They typically sing from the postal unions’ song sheet and regularly echo the unions’ arguments. For these politicians and their supporters, the Universal Service Obligation is sacrosanct. Across the aisle – or the rotunda, the “red” side doesn’t reject the value of or need for service, but it does look more closely at the cost of providing it. Accordingly, they’re more open to the idea of shuttering underproducing post offices (though not in their district, of course), of reducing delivery to five days and of moving away from both door and curbside to centralized delivery. They do not see the USPS as a provider of jobs for their own sake, or as an agency that should be tasked with obligations it can’t afford (except for the prefunding requirement). They understand the business reasons for changes to service standards, network rationalization, and facility consolidations. They seldom get kudos from the postal labor unions. Arguably, the fundamental issues, that no-one will squarely acknowledge, let alone address, are the Universal Service Obligation and the agency’s statutory charter to be a service operated in a business-like manner. Generally speaking, the USO mandates that the USPS provide nationwide delivery of mail and access to postal services. The cost of implementing the USO was to be offset by the revenue derived from the monopoly over addressed letters and access to the mailbox. In pre-internet and email times, when mailed messages were the norm, the financial premise of the USO worked, but that’s no longer the case. Electronic messaging continues to suppress First-Class Mail usage and severely stifle other forms of paper-based mailed communication, from advertisements to magazines. Meanwhile, despite shrinking mail volume, the size of the delivery network continues to grow, meaning less mail is being carried and delivered to more places. As a result, the USO’s financing mechanism no longer works; less mail(postage revenue) is being generated to cover the costs of providing the same or more of the required services. If this condition afflicted a service (presumably a publiclyfunded service) it would be bad enough, but for an institution mandated to operate in a business-like manner it’s more serious. It also exemplifies the incongruity of both the USPS mission and the expectations of those who engage in the conversation about restoring it to fiscal stability. Simply put, the problem is a misalignment of expectations – what service is wanted vs. what users will pay, i.e., how do users expect to pay for what they want – or do they? It’s all well and good to want post offices in every little burg, to want six-day delivery regardless of mail volume, to expect a letter mailed today to be delivered tomorrow 200 miles away, and to have postal employees well-paid and insulated from lay-off. It’s also great if postage rates can be moderated and “efficiency” can be achieved without anyone ever having to make a sacrifice. But that’s not the real world, or at least not the one in which the Postal Service and its customers find themselves. When the Postal Service recently filed to raise the price of a stamp by five cents, citizens wrote angry letters of protest to the Postal Regulatory Commission, decrying the impact of the increase on persons with a fixed income, criticizing the USPS for raising prices while cutting service, and complaining that steep price increases should be applied to “junk mail” instead. Such messages suggest that average people don’t understand the USPS business situation, but it also indicates what type of messages are sent to our legislators – people who aren’t exactly experts on postal finances themselves. As a result, at a time when the economic rationale of the USO seems questionable and when the USPS charter remains self-contradictory, any legislative discussion about the long-term viability of the Postal Service must not avoid facing the decision about what the USPS should be – a publicly-supported service or a rationally operated business. Avoiding that basic choice will only perpetuate the current circumstances, but avoiding it will probably be the preferred course for our timorous legislators. For them, it’s safer to tell voters they can have what they want and let someone else worry about paying for them. Did you miss the latest issue of Mailers Hub News? Looking for a previous article? Click here for the subscribers-only Mailers Hub News archives. Not a subscriber? Not a problem! Don't miss out on another issue, call 503-482-4636 or email [email protected] to sign up now! Comments on "Service Is Great - But Who Pays For It?"